Many years ago Professor Ping Ying Hsieh contributed an article to the new Buddhist magazine Hsin Fa which was published in Hong Kong under the guidance of the Venerable Master To Lun. 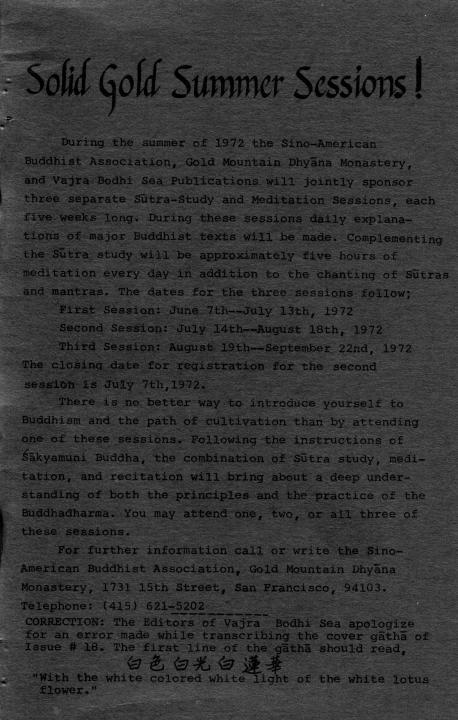 Although Professor Hsieh was unable to meet personally with the Master at that time, she planted a seed which would bear fruit more than twelve years later in San Francisco when she was able to visit Gold Mountain Dhyana Monastery and pay her respects to the Venerable Master in April of this year. An eminent scholar and Professor of Chinese Literature and Composition at the large and influential Taiwan Normal University in Taipei, Formosa, Professor Hsieh has been writing books and articles for more than fifty years. During that time she has published sixty books on a wide variety of subjects, both fiction and non-fiction. In addition to being a respected scholar and writer, Professor Hsieh is a popular teacher as well. What is more, Professor Hsieh is an ardent Dharma Protector. She has vigorously supported Buddhism for twenty years, and has received the respect of Buddhists in both East and West. About fifteen years ago she decided to turn her exceptional talents as a writer to the support of the Buddhadharma. At that time however, when she tried to write she found herself unable to set down a single word. Greatly discouraged she sought aid from the Bodhisattva Avalokitesvara. Soon she was able to write with ease, and since that time has brought out numerous articles on Buddhism which have appeared in all the important Buddhist publications, and has published two books about Buddhism as well. The wonderful response from the Bodhisattva awakened great faith in Professor Hsieh, and since that time her faith and joy in Buddhism has grown. The Sino-American Buddhist Association at Gold Mountain Dhyana Monastery was extremely pleased to have the opportunity to welcome Upasika Hsieh, and happy that she had the chance while visiting in the United States, to attend the Avatamsaka Dharma Assembly. The picture on the following page was taken in commemoration of the occasion. The Vajra Bodhi Sea Publications Society is honored to announce that Professor Hsieh will join the staff as Corresponding Advisor. 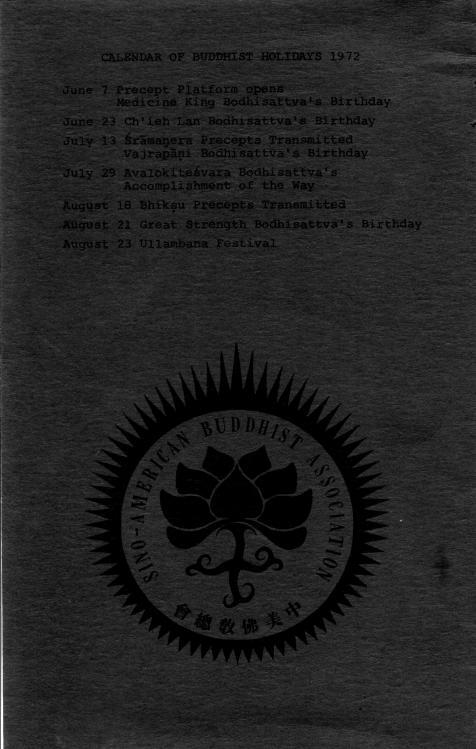 The Sangha of The Sino-American Buddhist Association, Gold Mountain Dhyana Monastery, and the Vajra Bodhi Sea Publication Society welcome Professor P.Y. Hsieh and her companions on their recent visit to Gold Mountain to pay their respects to the Venerable High Master To Lun. They are pictured here before the entrance of the Monastery. Front row, left to right, are Professor Hsieh, Dharma Masters Heng Ch’ih Heng Pai, Heng Kuan, Heng Ching, Heng Ch’ien, Heng Shou, Heng Shoou, and Heng Ch’ao. In the back row are: Upasikas Jean Chao and Wang, Chen-fen, Sramanera Kuo Yu and Sramanerika Kuo P’u.